As longtime readers of this blog know, I love and respect China’s hard-working entrepreneurial scrap peddlers; they are my scrap brothers. But, being fair minded, I thought it only right that I give the machine a chance to prove itself. Perhaps it could make an argument for its superiority? So, late on a recent afternoon, I donned my Scrap hat (see photos, below), and ventured onto Nanjing Road to give this new contraption the Shanghai Scrap Once Over. Let’s have a look, shall we? A couple of quick, off-the-bat observations. First, if the city’s goal was to achieve something environmentally friendly, this phone booth-sized metal device packed with electronics is an abject failure. Second, unless you actually go up to this device and read the instructions, there’s absolutely nothing self-evident about its purpose or function. That is, it fails the ‘what is it?’ test. And, on a related note, “Reverse Vending Machine” doesn’t help, and isn’t nearly as clever, or self-evident, as the manufacturer obviously thinks. But – you must be asking – how does it work? Fear not: Shanghai Scrap arrived with plastic bottles and a couple of aluminum cans to determine just that. To begin, I inserted a Nongfu Springs plastic water bottle into the hulking device’s … mouth? This is not a trivial point. It’s not enough to just slip your bottles past the lip of the machine. You’ve actually got to shove them in there a good six inches or so, up to your elbow, until they rest upon two rollers. Then, quite suddenly (while my arm was in it) the rollers begin to spin, and as they do, an orange light – presumably a bar code reader – searches for identifying features on the bottle (meaning, the machine can’t identify bottles from which labels have been peeled!). Anyway, my fully labeled Nongfu Springs bottle spun and spun and spun, and the orange lights, they flashed and flashed and flashed. And while all that was happening, a crowd which began to assemble around me, trying to figure out what I was doing with this big green can-like thing that nobody had ever noticed before … and telling me to stop sticking my arm in it, because I might get hurt. Note, in the above photo, the man in the yellow shirt to my left (I’m the guy in the Scrap hat). After a couple of minutes of watching my fruitless efforts at making the make the Reverse Vending Machine accept my bottle, Mr. Yellow Shirt inserted his hand into the device, examined the bottle, said, “Thank you” and promptly walked away with it. When I found him, a moment later, he was seated on a bench – beside the bag of bottles that he’d been collecting from people who’d also failed at their efforts with the Reverse Vending Machine. That is to say, the peddlers took the day, against the machine. A couple of final, quick notes on this device. First, unlike its problems with plastic bottles, the device had absolutely no problem identifying the aluminum can offerings that I brought it. Big surprise, that: aluminum is worth significantly more than plastic. 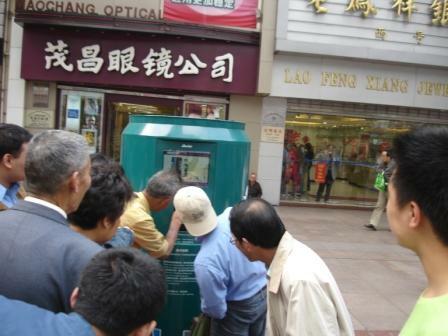 Second, Shanghai Daily quotes an official by the name of Cao, with the Nanjing Road Pedestrian Street Office as claiming that the Reverse Vending Machine “received more than 1700 bottle during the three day [May Day] holiday.” Which works out to a bottle every three minutes or so, for three straight days. Finally, a question: Can anyone out there think of another instance where a government unit in China has installed a technology with the express purpose of killing a labor-intensive business? I can’t. But there must be an example out there. 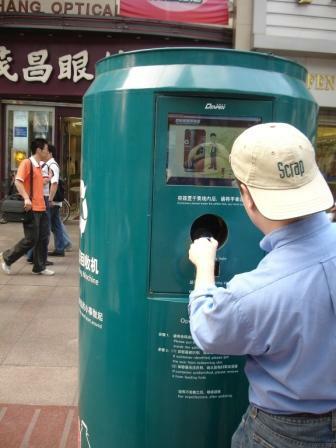 Anyway, unlike Shanghai Daily, I refuse to provide instructions on where to find the Big Dumb Recycling Machine. 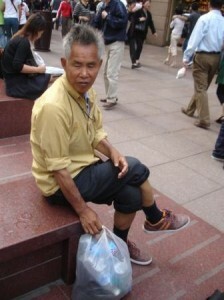 Instead, save your cans and bottles for the folks who really need them: your local Chinese scrap peddlers. This entry was posted in Business and Trade, Environment, Labor, Scrap, Weird China by Adam. Bookmark the permalink. What’s it say about Shanghai when the government is more concerned with getting rid of the recycling guys on Nanjing Road instead of all the hookers working it since Le Meridien opened? The authorities (I don’t know what level, municipal or district, but they are “the authorities”) made great efforts to clean up Nanjing East Road by demolishing the creep of small shops, built more gargantuan buildings and malls (gargantuism is an unavoidable feature of mainland Chinese taste in architecture and public policy), spruced up exteriors by ridding the clutter of signage, rusting supports, in general restoring and repairing the facades of older buildings, and “encouraged” pedestrians to a higher level of conduct all to compete with the newer commercial centers and retain the Huangpu district as Shanghai’s most important. That’s the context of the silly “return vending machine” but this, too, will pass perhaps at the comparatively slender cost of a mangled hand or two. I’m sure the more colorful characters will stay on. The famous example of “de-automization” is the automatic ticket-checking machines installed in the late 90’s in train stations all across China. Of course, after the labor-saving machines were installed, two or three railway employees were assigned to each machine, to manually take tickets from customers, insert them into the “automated” machines and then return them to customers at the other end of the turnstile. Classic. They should put all that r&d money into a state program to organize and employ the scrap peddlers, put ’em in uniforms and skills training for other employment. If you feel like a little extra charity, stuff a ¥5 or ¥10 note into an empty plastic water bottle, and throw it away. The recycler will find it and deserves it a hell of a lot more than any beggar. Max says no problem, but he put the bottle in three times before it worked! I hate the idea of putting those labourers out of business just because the city wants to have a better ‘face’. If they think those people are not so harmonious with the cosmopolitan’s image, they can organize them into teams and dress them up in uniforms. I guess that’ll still be much cheaper than the stupid machine over there. Local governments around China have been trying to shut down the scrap peddlers (some think it hurts their face; others hate the idea that the scrap peddlers are competing with municipal recycling programs). Fortunately, there are some very far-sighted officials and academics on the national level who are beginning to realize that the peddlers – or, the “recycling army” – can’t be defeated. They’re just too good at what they do. So, instead of trying to shut them down, they’re suggesting that the chinese government – at all levels – work with the peddlers, provide them with training, and organize them into a better coordinated national recycling program. It’s going to take time, but this result is far more likely than a nation filled with Big Dumb Recycling Machines. 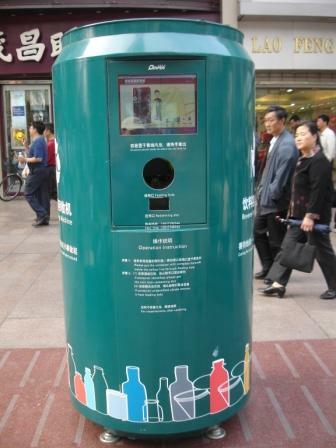 The existence of reverse vending machines save both professional bottle collectors and hobbyists energy to dig through the garbage cans on Nanjing Rd for bottles. It’s more sanitary this way. Shanghai is finally realizing that labor is getting too expensive. More and more people are going back to their villages to farm. Slow integration of automatic machines are the only way keep China’s labor advantage. This machine might not be the most thought out, but I applaud Shanghai’s Nanjing Road for giving it a try.